Tom is a writer and lecturer at the University of New England, NSW. 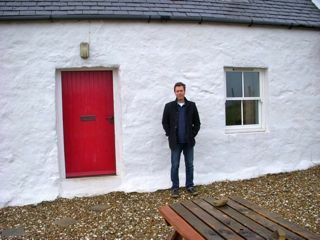 Tom came to Australia from the Department of English Literature at the University of Edinburgh (2010) where he was a Post-Doctoral Research Fellow in the Institute of Advanced Studies in the Humanities (IASH, 2009) following his period as British Academy funded Research Assistant in the School of Geosciences (2008). Tom’s research brings together literature, philosophy and geography; he is a research adjunct to RMIT’s Arts, Environment and Global Interpretation of Science group (AEGIS). Tom is published in The Australian Journal of Ecocriticism and Cultural Ecology, Green Letters: Studies in Ecocriticism, ISLE and Symbiosis, and is a member of the editorial board of PAN (Philosophy, Activism, Nature); he is President of ASLEC-ANZ (Association for the Study of Literature, Environment and Culture – Australia and New Zealand). Tom was resident writer at our City Data Slam as part of ISEA2013.